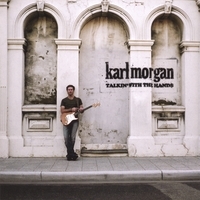 Karl Morgan is a blues guitarist, singer and songwriter whose explosion onto the blues scene, heralds the return of powerful, soulful, guitar-driven blues and rock & roll not heard since the great blues guitarists of the 1960s and 70s. Karl was a young West Australian boy when Stevie Ray Vaughan died in 1990, signaling the end of an era of devastating guitar artistry which began with the likes of Albert, Freddie and BB King and informed a generation of players from Jimmy Page to the Band; from Eric Clapton to SRV; from the Rolling Stones to Jimi Hendrix. Since the death of Stevie, great blues guitarists have been few and far between on the world stage. Karl Morgan is here to show us that the Blues - the great progenitor of modern music - has an enduring power to inspire and drive contemporary music with soul, with tone, and above all with feel. Karl has just relocated to Austin, TX where he is currently rehearsing with his new band. He will be playing shows from mid-August onwards, starting in Austin and then branching out all over the USA. A European tour is also being planned for 2009. Anyone interested in having Karl come and play in their town or city should get in touch via this page. Thank you all for your support so far. With an undeniable feel and a seemingly effortless knack for agility, this Australian guitarist has no trouble proving that he is no run-of-the-mill blues player. Blazing through 12 tracks of original songs (with the exception of one cover) that not only showcase his prowess on the frets, but also his uncanny ability to craft a magnificent song, this album truly speaks from the heart of a man who still holds great faith in the blues. While it would be easy (and fairly accurate) to compare the way he approaches his playing to Stevie Ray Vaughn, it's not that cut and dry. There's tinges of funk, soul, folk, and straight rock here that really make this album stand out, while simultaneously reflecting the genuine versatility with which he handles the instrument. While these songs are full of plenty of licks to appease finicky guitar fans and aficionados, there's also no shortage of finely penned lyrics that lock arms with the gut-wrenching vocals, making sure these tracks are more than just templates for guitar solos. His ear for tone and balance adds to this, making sure the guitar is the driving force in the structure, but not overbearing and unnecessarily showy. Accessible and honest, this is a welcome album for not only fans of good ol' fashioned electric guitar playing, but also those who are looking for some finely tuned songwriting as well. A sure thing: this is real and beautiful music! The best in a long time!!! What an artist! Can't wait to hear more from this guy and his outstanding guitar. Love it! I cannot take this CD out of my player since I bought it. I have been looking for a CD of rockin' blues for a long time -- who knew it would be a young guy from Australia. Don't let Karl's background put you off. This guy knows his blues guitar like he was born to it. So he sounds like Clapton and SRV, but he has his own take on it too. His original songs are as perfect as anything you'll get on the airwaves today. And his take on Bobby Hebb's "Sunny" is amazing, better than the original. BUY THIS CD. You will not regret it!! it is so right! if you love this one check out Eddie Cotton "Live at the Alamo". Fantastic blues that rocks with soul and passion. Karl's hands really do speak the blues. A fantastic album all the way through. Highly recommended! !